Pancreatosplenectomy (pancreaticosplenectomy) or spleen-preserving distal pancreatectomy is performed to surgically treat pancreatic disease of the tail and body. Distal pancreatectomy involves surgical resection of the body and tail of the pancreas to the left of the superior mesenteric vein (SMV)–portal vein confluence,  with or without splenectomy. The choice of procedure depends upon the disease process, the characteristics of the lesion, and the surgeon's experience. Spleen-preserving distal pancreatectomy is reserved for chronic pancreatitis, proven benign pancreatic lesions and cysts, neuroendocrine tumors, and trauma. Lesions in the body and tail of the pancreas become symptomatic as they enlarge and invade surrounding structures. However, with the increasing use of imaging studies, more incidental pancreatic lesions are discovered and diagnosed. Smaller lesions diagnosed at earlier stages are more amenable to surgical treatment. Adenocarcinomas of the distal pancreas account for 15-25% of pancreatic adenocarcinomas. Distal pancreatosplenectomy with lymphadenectomy is indicated for adenocarcinoma that is locally resectable without distant metastasis. Spleen-preserving distal pancreatectomy is contraindicated for malignant lesions of the distal pancreas. Neuroendocrine tumors represent 2-4% of pancreatic tumors. All neuroendocrine tumors have malignant potential and should be resected with curative intent. Solid pseudopapillary tumors are evenly distributed throughout the pancreas, with 46-67% present in the body and tail. These tumors represent 0.9-2.5% of solid pancreatic tumors, with 82-93% of cases diagnosed in young women. Attempts should be made for curative resection unless other contraindications are present. Serous cystadenomas are typically benign and represent 20-40% of cystic pancreatic tumors. Mucinous tumors have malignant potential and account for 20-40% of cystic tumors. Resection is indicated in symptomatic enlarging cysts greater than 2 cm. Intraductal papillary mucinous tumor is believed to follow the adenoma carcinoma sequence and should be resected with curative intent. Symptomatic or enlarging pancreatic pseudocysts can be treated with distal pancreatectomy after the acute pancreatitis episode has resolved. However, pseudocysts are best treated with internal drainage procedures as opposed to resection. The pancreas, from Greek pan- ("all") and kreas ("flesh"), is a 12- to 15-cm-long J-shaped (like a hockey stick), soft, lobulated, retroperitoneal organ. It lies transversely, though a bit obliquely, on the posterior abdominal wall behind the stomach, across the lumbar (L1-2) spine (see the image below). 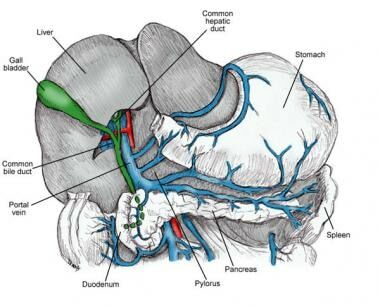 The head of the pancreas lies in the duodenal C loop in front of the inferior vena cava (IVC) and the left renal vein. The body and tail of the pancreas run obliquely upward to the left in front of the aorta and left kidney. The pancreatic neck is the arbitrary junction between the head and body of the pancreas. The narrow tip of the tail of the pancreas reaches the splenic hilum in the splenorenal (lienorenal) ligament. When a splenectomy is planned with a distal pancreatectomy, meningococcal, pneumococcal, and Haemophilus influenzae type B vaccines should be given, ideally 2 weeks prior to the planned resection. Antibiotics, such as a second- or third-generation cephalosporin, should be administered 30 minutes prior to incision. Multiple meta-analyses have demonstrated laparoscopic distal pancreatectomy to be safe with improved postoperative outcomes compared to open resection. Jin et al found laparoscopic distal pancreatectomy to be associated with fewer blood transfusions, decreased blood loss, earlier oral intake, and fewer surgical site infections (SSIs). There was no difference found in operative time or incidence of pancreatic fistula. In a retrospective review by Kooby et al,  short-term oncologic outcomes (node harvest, margin status) and long-term oncologic outcomes (survival) were comparable in open and laparoscopic distal pancreatectomy. A review article by Borja-Cacho et al  concluded that laparoscopic distal pancreatectomy had a similar morbidity to open pancreatectomy, but had a decreased length of stay. This study concluded that laparoscopic distal pancreatectomy is a safe procedure that is appropriately used for benign pancreatic disease. A randomized, prospective multicenter trial is required for further comparison to determine if laparoscopic distal pancreatectomy is appropriate in malignant pancreatic lesions. In a randomized trial by Nigri et al,  the conversion rate for laparoscopic to a hand-assisted technique was 37%. The conversion rate for laparoscopic to open was 11%. Reasons for conversion include multiple intra-abdominal adhesions and hemorrhage. Murakawa et al evaluated short- and long-term outcomes in 49 consecutive patients who underwent radical antegrade modular pancreatosplenectomy (RAMPS; see Technique) for pancreatic cancer. They reported a median operating time of 278 minutes (range, 140-625), a median intraoperative blood loss of 850 mL (range, 60-2790), an overall morbidity of 51.4%, and a mortality of 0%. After follow-up (median, 41.1 months), the 1-year overall survival rate was 84.1% and the 3-year overall rate was 38.6%. Median overall survival was 22.6 months. Abe et al studied 93 patients who underwent treatment of pancreas body and tail adenocarcinoma, comparing the results of standard retrograde pancreatosplenectomy (n = 40) with those of RAMPS (n = 53). In the RAMPS group, more lymph nodes were retrieved (28.4 ± 11.6 vs 20.7 ± 10.1), R0 resection was more frequent (90.5% vs 67.5%), there was less intraoperative bleeding (485.4 ± 63.3 mL vs 682.3 ± 72.8 mL), and operating time was shorter (267.3 ± 11.5 min vs 339.4 ± 13.2 min). Hamilton NA, Hawkins WG. Distal pancreatectomy. Chen H, ed. Illustrative Handbook of General Surgery. London: Springer; 2010. 311-20. [Full Text]. Morgan KA, Adams DB. Solid tumors of the body and tail of the pancreas. Surg Clin North Am. 2010 Apr. 90 (2):287-307. [Medline]. Dudeja V, Christein JD, Jensen EH, Vickers SM. Exocrine pancreas. Townsend CM Jr, Beauchamp RD, Evers BM, Mattox KL, eds. Sabiston Textbook of Surgery. 20th ed. Philadelphia: Elsevier; 2017. 1520-55. Lunger J, Mair K, Junger M, Schoenberg, MH. Distal pancreatectomy in patients with chronic pancreatitis. Berger H, Matsuno S, Cameron J. Diseases of the Pancreas: Current Surgical Therapy. Berlin: Springer; 2008. 441-51. [Full Text]. Bell RH, Denham EW. Distal pancreatectomy. Clavien P-A, Sarr MG, Fong Y, eds. Atlas of Upper Gastrointestinal and Hepato-Pancreato-Biliary Surgery. Berlin: Springer; 2007. 929-47. [Full Text]. Rahbari NN, Mollberg N, Moritz K, et al. Surgical resection for pancreatic cancer. Neoptolemos JP, Urrutia RA, Abbruzzese J, Buchler MW, eds. Pancreatic Cancer. New York: Springer; 2010. 1: 971-96. [Full Text]. Jusoh AC, Ammori BJ. Laparoscopic versus open distal pancreatectomy: a systematic review of comparative studies. Surg Endosc. 2012 Apr. 26 (4):904-13. [Medline]. [Full Text]. Pericleous S, Middleton N, McKay SC, Bowers KA, Hutchins RR. Systematic review and meta-analysis of case-matched studies comparing open and laparoscopic distal pancreatectomy: is it a safe procedure?. Pancreas. 2012 Oct. 41 (7):993-1000. [Medline]. [Full Text]. Kooby DA, Hawkins WG, Schmidt CM, et al. A multicenter analysis of distal pancreatectomy for adenocarcinoma: is laparoscopic resection appropriate?. J Am Coll Surg. 2010 May. 210 (5):779-85, 786-7. [Medline]. Kang CM, Lee SH, Lee WJ. Minimally invasive radical pancreatectomy for left-sided pancreatic cancer: current status and future perspectives. World J Gastroenterol. 2014 Mar 7. 20 (9):2343-51. [Medline]. [Full Text]. Chen K, Liu XL, Pan Y, Maher H, Wang XF. Expanding laparoscopic pancreaticoduodenectomy to pancreatic-head and periampullary malignancy: major findings based on systematic review and meta-analysis. BMC Gastroenterol. 2018 Jul 3. 18 (1):102. [Medline]. [Full Text]. Xie K, Zhu YP, Xu XW, Chen K, Yan JF, Mou YP. Laparoscopic distal pancreatectomy is as safe and feasible as open procedure: a meta-analysis. World J Gastroenterol. 2012 Apr 28. 18 (16):1959-67. [Medline]. [Full Text]. Jin T, Altaf K, Xiong JJ, Huang W, Javed MA, Mai G, et al. A systematic review and meta-analysis of studies comparing laparoscopic and open distal pancreatectomy. HPB (Oxford). 2012 Nov. 14 (11):711-24. [Medline]. [Full Text]. Borja-Cacho D, Al-Refaie WB, Vickers SM, Tuttle TM, Jensen EH. Laparoscopic distal pancreatectomy. J Am Coll Surg. 2009 Dec. 209 (6):758-65; quiz 800. [Medline]. Nigri GR, Rosman AS, Petrucciani N, Fancellu A, Pisano M, Zorcolo L, et al. Metaanalysis of trials comparing minimally invasive and open distal pancreatectomies. Surg Endosc. 2011 May. 25 (5):1642-51. [Medline]. Daouadi M, Zureikat AH, Zenati MS, Choudry H, Tsung A, Bartlett DL, et al. Robot-assisted minimally invasive distal pancreatectomy is superior to the laparoscopic technique. Ann Surg. 2013 Jan. 257 (1):128-32. [Medline]. Suman P, Rutledge J, Yiengpruksawan A. Robotic distal pancreatectomy. JSLS. 2013 Oct-Dec. 17 (4):627-35. [Medline]. [Full Text]. Murakawa M, Aoyama T, Asari M, Katayama Y, Yamaoku K, Kanazawa A, et al. The short- and long-term outcomes of radical antegrade modular pancreatosplenectomy for adenocarcinoma of the body and tail of the pancreas. BMC Surg. 2015 Oct 30. 15:120. [Medline]. [Full Text]. Abe T, Ohuchida K, Miyasaka Y, Ohtsuka T, Oda Y, Nakamura M. Comparison of Surgical Outcomes Between Radical Antegrade Modular Pancreatosplenectomy (RAMPS) and Standard Retrograde Pancreatosplenectomy (SPRS) for Left-Sided Pancreatic Cancer. World J Surg. 2016 Sep. 40 (9):2267-75. [Medline]. Resnick AS, Drebin JA. Distal pancreatectomy. Lowry AM, Leach SD, Philip PA, eds. Pancreatic Cancer, MD Anderson Solid Tumor Oncology Series. Berlin: Springer; 2008. 341-50. [Full Text]. Napolitano C, Valvano L, Grillo M. Distal splenopancreatectomy: Indications for surgery and technical notes. Siquini W, ed. Surgical Treatment of Pancreatic Diseases. Milan: Springer; 2009. 321-28. [Full Text]. Strasberg SM, Linehan DC, Hawkins WG. Radical antegrade modular pancreatosplenectomy procedure for adenocarcinoma of the body and tail of the pancreas: ability to obtain negative tangential margins. J Am Coll Surg. 2007 Feb. 204 (2):244-9. [Medline]. He Z, Qian D, Hua J, Gong J, Lin S, Song Z. Clinical comparison of distal pancreatectomy with or without splenectomy: a meta-analysis. PLoS One. 2014. 9 (3):e91593. [Medline]. [Full Text]. Tang CW, Feng WM, Bao Y, Fei MY, Tao YL. Spleen-preserving distal pancreatectomy or distal pancreatectomy with splenectomy? : Perioperative and patient-reported outcome analysis. J Clin Gastroenterol. 2014 Aug. 48 (7):e62-6. [Medline]. [Full Text]. Li BQ, Qiao YX, Li J, Yang WQ, Guo JC. Preservation or Ligation of Splenic Vessels During Spleen-Preserving Distal Pancreatectomy: A Meta-Analysis. J Invest Surg. 2018 Apr 11. 1-16. [Medline]. Song J, He Z, Ma S, Ma C, Yu T, Li J. Clinical Comparison of Spleen-Preserving Distal Pancreatectomy With or Without Splenic Vessel Preservation: A Systematic Review and Meta-analysis. J Laparoendosc Adv Surg Tech A. 2018 Oct 12. [Medline]. Schulick RD, Cameron JL. Pancreatic and periampullary carcinoma. Yeo CD, ed. Shackleford's Surgery of the Alimentary Tract. 6th ed. Philadelphia: Saunders; 2007. Vol 2: Chap 91. Worhunsky DJ, Zak Y, Dua MM, Poultsides GA, Norton JA, Visser BC. Laparoscopic spleen-preserving distal pancreatectomy: the technique must suit the lesion. J Gastrointest Surg. 2014 Aug. 18 (8):1445-51. [Medline]. Kim EY, You YK, Kim DG, Hong TH. Dual-Incision Laparoscopic Spleen-Preserving Distal Pancreatectomy: Merits Compared to the Conventional Method. J Gastrointest Surg. 2018 Oct 26. [Medline]. Zhao W, Liu C, Li S, Geng D, Feng Y, Sun M. Safety and efficacy for robot-assisted versus open pancreaticoduodenectomy and distal pancreatectomy: A systematic review and meta-analysis. Surg Oncol. 2018 Sep. 27 (3):468-478. [Medline]. Niu X, Yu B, Yao L, Tian J, Guo T, Ma S, et al. Comparison of surgical outcomes of robot-assisted laparoscopic distal pancreatectomy versus laparoscopic and open resections: A systematic review and meta-analysis. Asian J Surg. 2018 Oct 15. [Medline]. Maithel SK, Allen PJ. Techniques of pancreatic resection: pancreaticoduodenectomy, distal pancreatectomy, segmental pancreatectomy, total pancreatectomy, and transduodenal resection of the papilla of Vater. Jarnagin WR, Allen PJ, Chapman WC, D'Angelica MI, DeMatteo RP, Do RKG, et al, eds. Blumgart's Surgery of the Liver, Biliary Tract and Pancreas. 6th ed. Philadelphia: Elsevier; 2017. 1007-23. Kelly KJ, Greenblatt DY, Wan Y, Rettammel RJ, Winslow E, Cho CS, et al. Risk stratification for distal pancreatectomy utilizing ACS-NSQIP: preoperative factors predict morbidity and mortality. J Gastrointest Surg. 2011 Feb. 15 (2):250-9, discussion 259-61. [Medline]. Bell CG, Nakeeb A, Lillemoe KD. Procedures for benign and malignant pancreatic disease. Brennan MF, Cheung LY, Wilmore DW. ACS Surgery: Principles and Practice. Philadelphia: Decker Publishing; 2010. 24. [Full Text]. Salky B. Distal pancreatectomy. Scott-Conner C, ed. The SAGES Manual: Fundamentals of Laparoscopy, Thoracoscopy, and GI Endoscopy. New York: Springer; 2006. 393-99. [Full Text]. Gurusamy KS, Koti R, Fusai G, Davidson BR. Somatostatin analogues for pancreatic surgery. Cochrane Database Syst Rev. 2013 Apr 30. 4:CD008370. [Medline]. [Full Text]. Butturini G, Daskalaki D, Bassi C, et al. Pancreatic fistulas after pancreaticoduodenectomy or distal pancreatectomy. Siquini W, ed. Surgical Treatment of Pancreatic Diseases. Milan: Springer; 2009. 403-10. [Full Text]. Ligated tail of the pancreas. Ligated vessels of the pancreas.